There is a lot going on in Lyon this weekend! Here's the first event I want to fill you in on. Husbands and boyfriends, listen up. I'm going to let you in on a cheap date night idea. If you visit the Vinomedia website, you can fill out a form online requesting free tickets to the second annual Salon International de l’Œnotourisme. 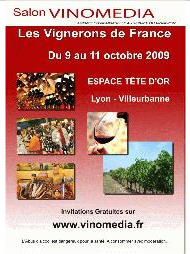 Discover over 200 French wines from around the country, learn about organic wines, and of course - tastings! 30 seconds later, they magically appear in your inbox. Just print and presto. You've just made romantic plans for the weekend.